In the real, offline world, your chosen selection (and placement) of furnishings & artwork combine to create a warm & fuzzy feeling for those who walk through your front door. And it’s not all that different online. The difference is that, online, you need to use your words to create that same welcoming feeling. You need to compose your words in a way that let’s your dream clients know that they’ve come to the right place. They have certain things that they want to know before they can fully trust you and give you their email address or agree to work with you. Answering these 4 simple questions will help you convince your audience that you’re the right person for them and encourage them to explore your site further. Try this simple formula if you haven’t got yours down to a fine art yet. Now that you can explain the essence of who you are in one sentence, you can follow it up with other words to explain the most important things about you. Don’t feel restricted to just one sentence. Not all home pages are short. Find a length that works for you and gets your value across in a way that appeals to your audience. Experiment until you’re happy with what you’ve got. Now that you’ve explained who you are, you need to show your audience how they’ll benefit from sticking around. I love this section of the equation because it’s the core of why you’re in business – to help people. If you’re supremely passionate about what you do, it might be easy for you to explain how your clients benefit from working with you. But, most likely, you have so many ideas swirling around in your mind that you struggle to narrow down to the one or two that succinctly explain your value. It might help you to keep in mind that you don’t have to list every single way you add value to your clients’ lives. Try and focus on the 3 or 4 main ways you help them – the most important ones with the biggest impact on them. What keeps them awake at night before working with you, but is solved by the time you’re finished together? Just by changing the words on your website, I help you attract more dreamy clients, make more money, & intensify your impact on the world. I get all the ideas that are swirling around in your head out on paper for the world to see. I hold a mirror up to you and your business so that you can see how special it is (and then tell your clients about it). I help you cut through the fads and get straight to what works on your waistline. I get the healthy greens straight into your fridge every week so that you don’t even need to think about it. I help you fit a healthy lifestyle into your busy schedule so easily that you’ll hardly even notice it. You might think that everything you wrote down in Number 2 is self explanatory and the ‘why should I care’ question is redundant. But think of it like laying the foundation for a house. The first layer (Question 1) lays the foundation by neatly explaining your value. Each layer after that adds more and more info to keep reeling your reader in. Every layer addresses their doubts a bit more. Every layer piques their interest a bit more and encourages them to read further. 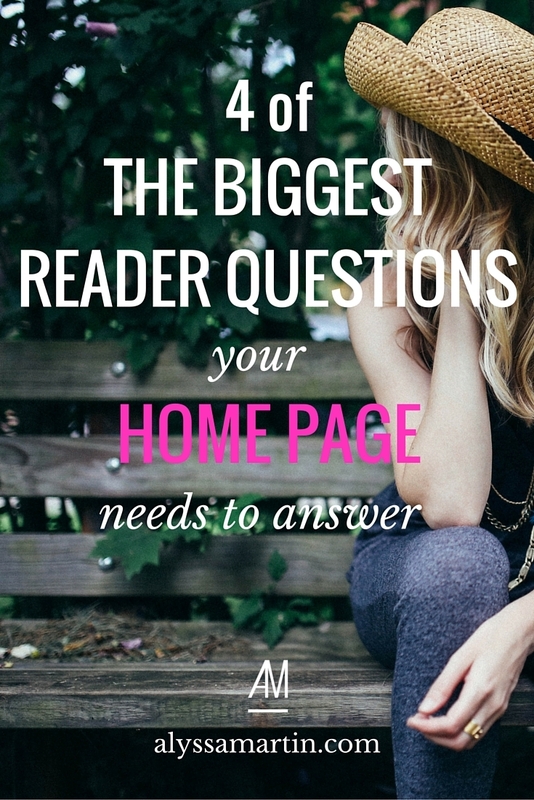 Until, finally, you have a solid house / homepage that makes your reader feel like it was written just for her. Who else is using this product / service? How have you helped others with my problem? For this question, numbers help. If you’ve got thousands of people on your email list, say so. If you’re a business coach with a seven figure business, say so. If you’ve helped your clients collectively lose 10,000kgs, say that too. It’s what is known as social proof. People want to know that you and your business have been tried and tested by others. Your dream clients has landed on your homepage and made it through your content. Now what should they do? Chances are that you want them to sign up for to your email list or visit your services page. So, tell them that. Be explicit. Don’t assume they will figure it out for themselves. I’m talking about a Call to Action. Voila. You have paved the way for a rock solid homepage that addresses all of your dream clients’ fears and concerns. Does it make you feel more confident about your value? Like you’ve got to the crux of what makes your business awesome? Yes? Then you’ve done a great job. I’m proud of you. P.S. You might also like to read this post for clever tricks to get your message across in your web copy. We’re talking small word choices that make a big difference.